As Indiana's largest leisure travel agency, AAA has harnessed its people-reaching power to aggressively promote and encourage consumer leisure travel for over 100 years. As the best place to attract the most desirable vacation planners, AAA Hoosier Motor Club is excited to invite you to meet face-to-face with Indiana's most sought-after travel consumers. 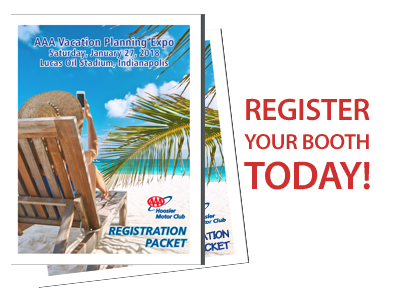 The AAA Vacation Planning Expo will deliver an audience who has tremendous buying power and is continuing to spend well above the national average on travel and travel-related products. Exhibitors include: tour operators, cruise lines, Convention and Visitors Bureaus, Tourist Boards, hotels, attractions, and travel related services and products.